The General clearly sees his battle lines and was wise enough to protect his troops today as we approached a key trenchline that the bulls had to defend. He understands that he must always have enough troops left following one battle to fight the next. So he builds up his defenses, and watches the battle for his next move. 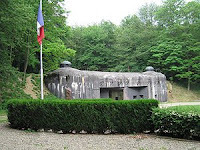 If you’re like me and it’s been awhile since you’ve studied your early Twentieth Century French war history, then here’s a link to Wikipedia with a fascinating description of exactly what the Maginot Line was. Be sure to scroll down to the bottom and look at the maps and historic pics. Give the bulls their credit. They stepped up and defended 800 once again by initiating a high volume straight up charge into the close. The short term momentum the bears had off the Monday high was broken and I've projected out what could be the micro degree wave 2 for this move. After 2 more precise pins off the bottom of my wave 3 channel I now see those set of trenchlines as being even more important going forward. I am going to look to redeploy bear troops I covered near the top of the yellow channel if I get the chance. Despite the bulls valiant end of day charge I think it could all have been part of the master plan Trojan Horse trap the bears have been laying down for over 2 years. I included a couple of charts of the VIX demonstrating the count and pattern I think may be in play there and I'll be damned if that doesn't look like a stick figure horse. 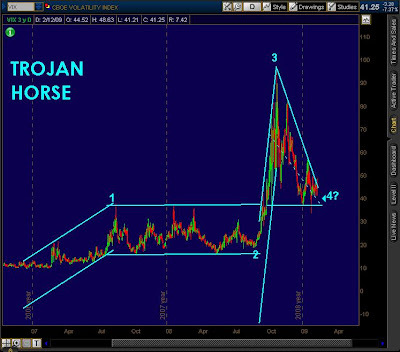 The key to pay attention to is the VIX triangle. Until the bulls manage to push the VIX back under 38 you need to be very cautious and short-term with any bull positions. 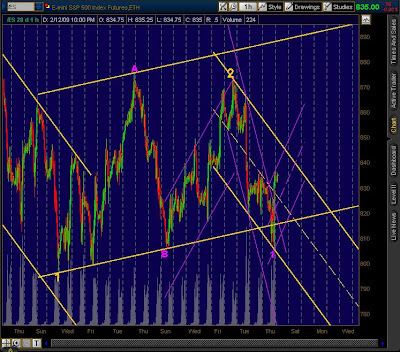 The breakout from the horse (wave 4 triangle) and bull slaughter could happen at anytime. If we are set to break 800 my guess is it will happen suddenly with no warning on a gap down type of action as that is usually how major breaks occur. 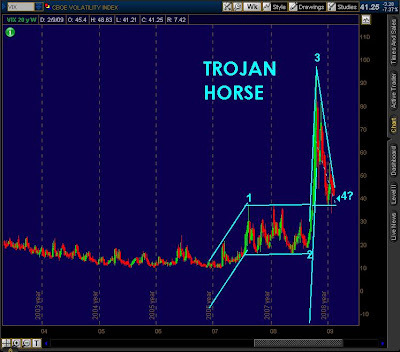 Expect the bears to spring out of the VIX horse at the same time making it expensive to buy any protection for the next leg down. In order for the bulls to prove this is more than just a minor correction off of the Monday high, they will need to first get back above the 848 pivot and 2nd take out new highs. Being that this is a 2 it is possible and some would say likely it will be a powerful retrace that at some point tests the bears resolve that the first move was real.